Here’s A Great Configuration Idea. Adding a second punch station. To Speed up production our customer installed a second punch unit on his 55 Ton Edwards Ironworker. This company is a manufacturer of utility trailers. These are the flatbed trailers available to attach to trucks and cars. They are fabricated out of angled steel parts joined together. The bed and sidewalls can be composed of either expanded metal or 2 x 6 timber. The steel angle requires two different sized punched holes for attachment. By adding the second punch unit to the 55 Ton Ironworker’s Open station he saves significant time which would have been spent changing punch dies. Jobs go through faster to meet distributor demands. Calculate the Edwards Ironworker Tonnage required for a clean punch based on hole size and steel thickness. Selecting the right ironworker for your projects is critical. If you have an under powered punch, there are a couple of things which can happen. You just might not be able to penetrate the material you are working with. The punch may shatter and potentially cause damage to the project or injury to you. 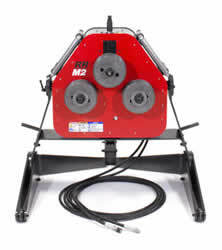 Call Jason with questions 1-800-748-9068 I will recommend the right ironworker and see about getting you a good price. It’s possible to create a spear top for a picket fence using an ironworker a specialty punch and square tubing. The example below is a spear type top for a steel picket fence. With a specialaty punch a square tube can add a spear top with one pass of a punch on an ironworker. 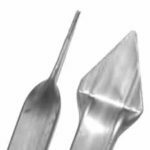 Something to keep in mind when selecting punches is to make sure you use the right punch for the purpose. A common use for a punch is to make holes for attaching bolts to a second work piece. If this hole is for a bolt you should use a punch 1/16″ larger than the bolt you plan to use. This will make sure that the bolt will go through the hole without problems. So for a 1/2″ hole you should use a 9/16th punch. The Edwards 20 Ton Horizontal Press is a versatile tool. Watch the video and observe the ways different tooling makes work easier. Use this horizontal press to bend, form brake and straighten mild steel. It accepts a a lot of different tooling. This press is designed for maximum tooling flexibility, the 4 pin locations are locked with a simple crank for inboard tool squaring. There is an included digital encoder reads positive stop for accurate repeatability within 0.01″. Edwards Ironworker is offering a new tube & pipe bending accessory called the Radius Roller it will roll round and square tubing and quickly adjusts for each job. 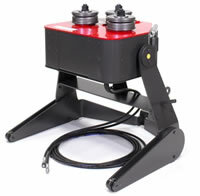 It is compatible with Ironworkers with the Hydraulic Power Pack or the standalone Hydraulic Power Unit. The Radius Roller quickly adjust from Vertical to Horizontal for added flexibility for your particular bending application. Adjusting for pipe or tube size is done fast by inserting washer/spacers between rollers. Call us for pricing and availability and for your best quote. Can a 55 Ton Ironworker punch a standard oblong hole 13/16″ x 1″ is a 5/16″ thick piece of A36 material ? This question had to do with punching a 1/2 inch hole in 2 inch angle iron. The angle iron is 1/4 inch thick. Upon going to another shop where there was an ironworker our contact was told that a die mounting nut would get in the way of the punch. The solution is to punch the hole with the opposite leg of the angle iron hanging down from the front of the standard “pedestal die table”. If that does not quite work there are available offset dies from Edwards Ironworker as an alternative. 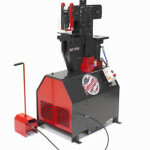 The 25 Ton Edwards Ironworker is at home in a small fab shop or even an home metal shop. It makes some projects just that much easier. Punching though supports is quicker than drilling. With the second, open station, you can expand the capabilities of the unit quite a bit. Buy and add a bar shear. Swap that out with an angle shear or a press break or a notcher. You can accomplish a lot with a unit that will work in just about any environment. Anyone out there with a small ironworker on their home shop?